So, following my inner voice, I enjoyed this Saturday night. To find out what mizuhiki is, click here. In case you are wondering -- I never drink at my parents’ house. (The New Year’s ceremony is an exception, but you know how much we drink for that? 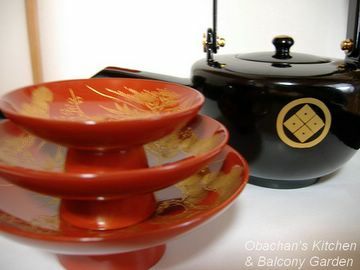 Though the lacquer sake cups are quite big, we pour no more than a few drops of sake into the smallest one on top, so it doesn’t count as "drinking.") It’s not because I’m scared of my dad who used to say, “Women shouldn’t drink!” He probably wouldn’t care any more, but still I don’t feel like drinking there, especially when I’m always wanted by my niece and nephew for playing othello game and Japanese chess. 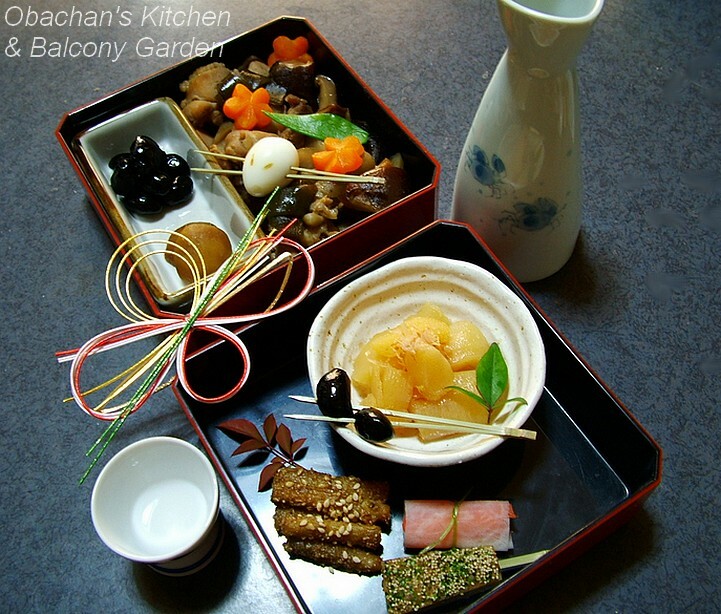 Anyway, to start my 2007 sake & sakana series, I made some appetizer-type osechi food in addition to the leftover from New Year’s Day and arranged them like this. Perhaps you can see my obvious intention to show off my knife skills I have acquired recently. ;) The black beans (kuromame) and kazunoko (herring roe) were the leftovers. The rest was made this afternoon. Yes, it took all afternoon but let me tell you -- it was worth it. This sake is actually the leftover of our otoso this year and I brought it with me when I came back to my apartment. :P This brand, Tosazuru 土佐鶴 is probablyh the most popular brand in the eastern part of this prefecture, if not the whole prefecture. To tell you the truth, I cannot be a fair judge of this brand, because this is the sake I’m most familiar with since my childhood. 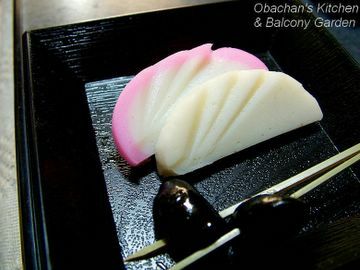 No, I wasn’t a drinker when I was a kid, but I did taste Tosazuru at various traditional ceremonies when kids were allowed to lick just a little bit of it. And for such ceremonies, cheaper versions were always used, of course. So, when it comes to Tosazuru, I like the familiar dry taste of the cheaper versions better than ginjo or daiginjo. In the white bowl is kazunoko topped with fine bonito flakes. I put two kuromame there just to create a nice color contrast. 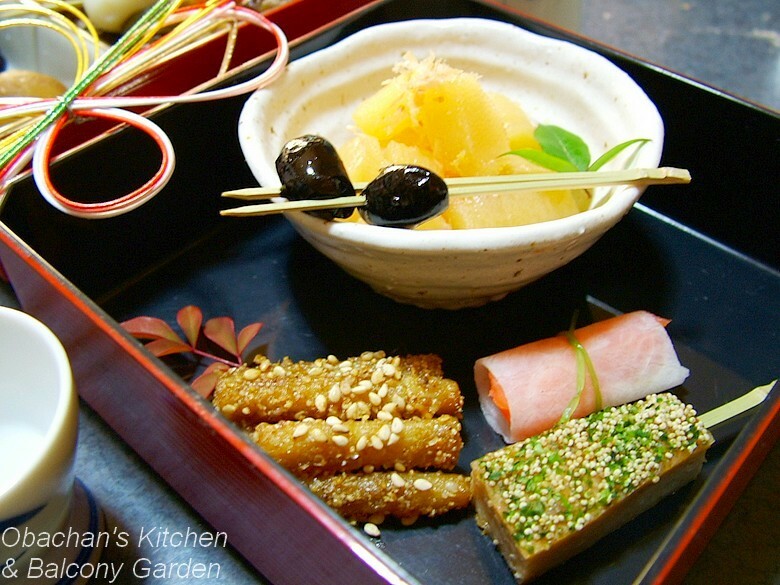 The brown log-like food (front left) is tataki-gobo (pounded burdock? ), which I tried for the first time and immediately fell in love with. The sourness of the vinegar used for seasoning contrasted very well with the sweetness of roasted and ground sesame seeds. And the texture was delightfully crunchy! The pink stuff wrapped in the white wrapper is also my new favorite: it’s smoked salmon wrapped with paper-thin daikon and tied with mitsuba stem. It's such a great idea that I found on the net. It requires absolutely no seasoning -- all you have to do is slice, wrap and tie -- and you can enjoy the wonderful harmony of flavors and texture. Believe me, the slight bitterness of mitsuba stem adds a nice kick at the end and I really admire the person who came up with this idea first. Nishime (simmerd chicken and vegetables) was not a great success, but aren’t these carrots (representing plum blossoms) cute? The little bunny on top (Yes! Bunny!) 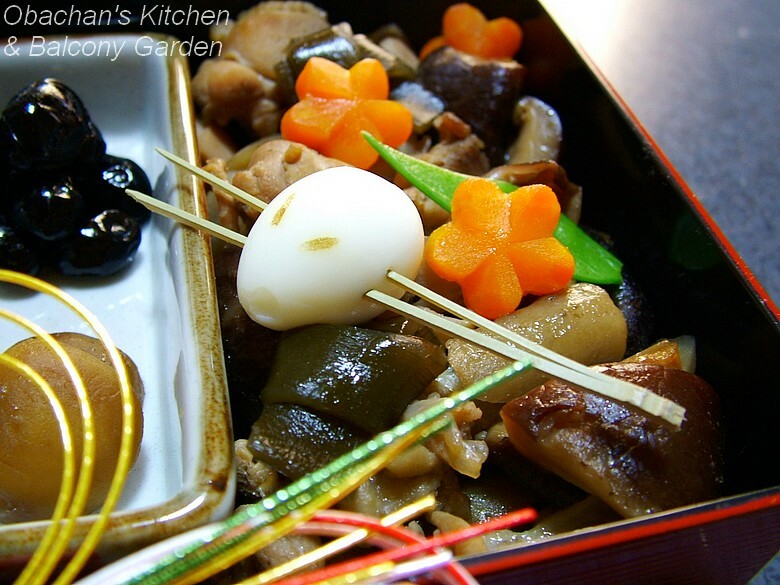 was made with a boiled quail egg. I heated the tip of a stainless skewer and pushed it against the egg to make the brown brands which were supposed to be bunny's ears. Well, I tried some of the knife skills introduced on this site, so please take a look. 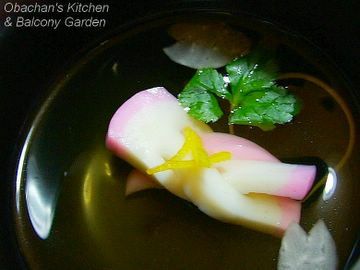 It was so much fun to make soft and elastic Kamaboko (steamed fish cake) into many different shapes. It only took you a few hours to prepare this so beautifully? I think this would take me a day or two!! That's a very cute osechi. I like the bunny a lot.